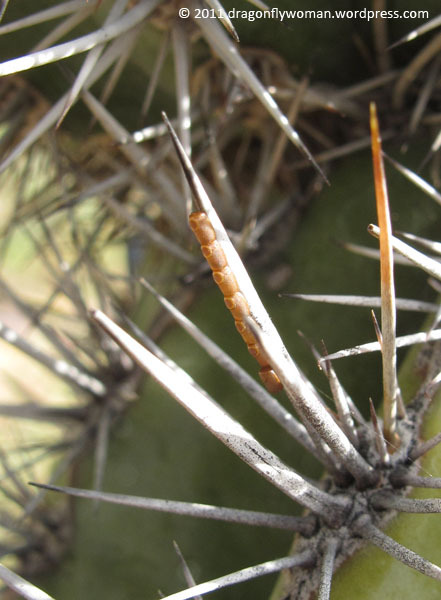 Eggs on a barrel cactus spine. I have no idea what these are, but I wish I did! The eggs are gorgeous and have some bizarre structures that I would like to look into further. If you know what these are, I’d love to hear from you! I found them on a barrel cactus in October. Moth ovipositing on sliding glass door. I was sitting on my couch reading one night when I looked up and noticed a moth (likely a noctuid, though honestly I didn’t look that closely) moving around strangely on the sliding glass door to the backyard. I got up to see what it was doing and noticed it was laying eggs! I ran to get my obsolete point and shoot digital camera and took the photo from inside the house through the very dirty glass. This produced a rather cruddy photo. Still, it makes me smile every time I see it because it was fun to watch the mom laying her eggs on my door. All of the eggs eventually hatched, so presumably her efforts were worth it! I despise most fruits, but I eat the few I like in massive quantities when they’re in season. Last summer I was happily working my way through an entire pound of some of the most delicious organic strawberries I’d ever had when I noticed the little cluster of eggs on this berry just before I popped it into my mouth. Because I’m me, I pondered the beauty of the drab grey eggs against the bright red strawberry for a while and decided it warranted a photograph. I love how the photo turned out! 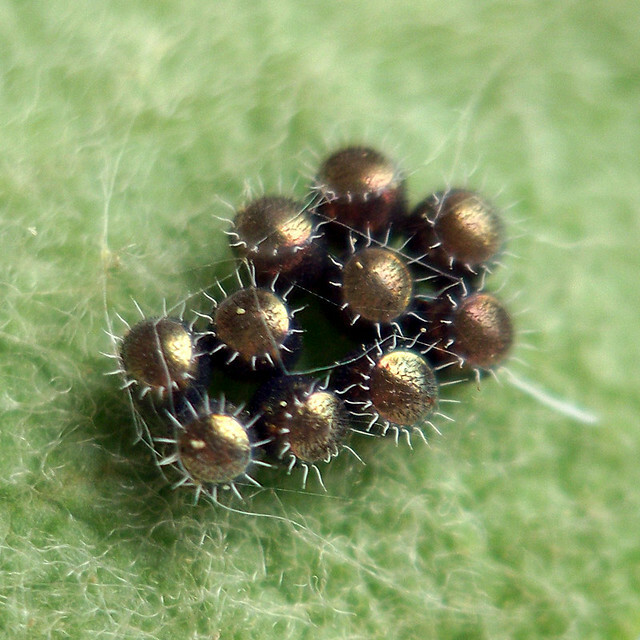 I didn’t think to save the eggs to identify them, but I think they’re probably stink bug eggs based on the features I can see in my photos. 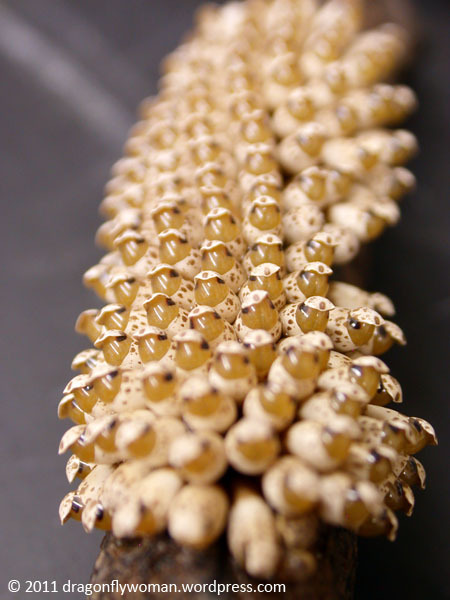 Last but not least, these are some of the eggs I study, laid by the giant water bug Lethocerus medius. This species is an emergent brooder and lays its eggs above the water line. 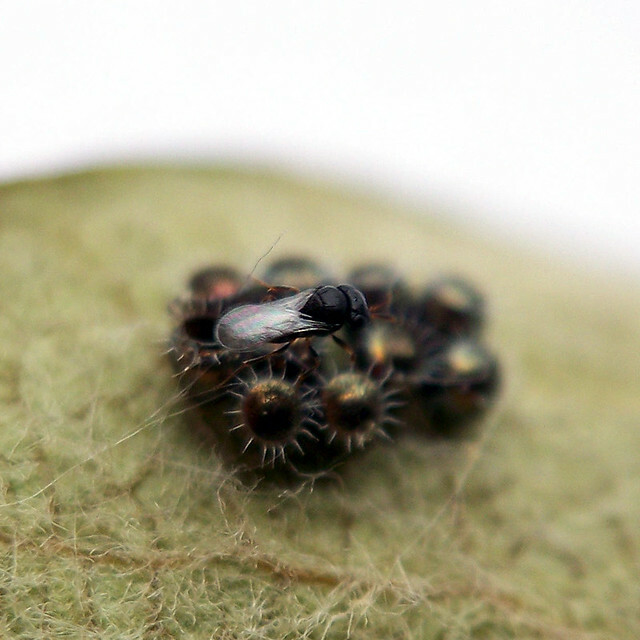 The father then carries water to the eggs and protects them until the nymphs hatch. They are gorgeous, enormous eggs, but they’re even more impressive when they hatch. 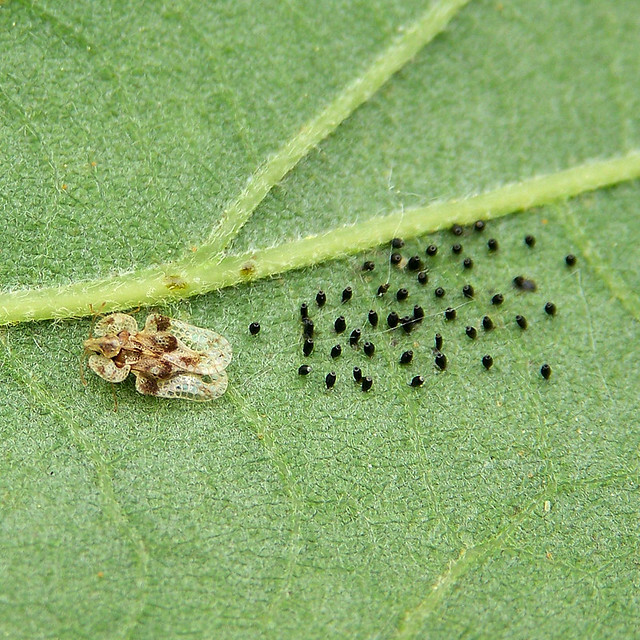 The nymphs hatch synchronously, so 200+ little water bugs wriggle their little bodies out the eggs at the same time. It’s an amazing sight! 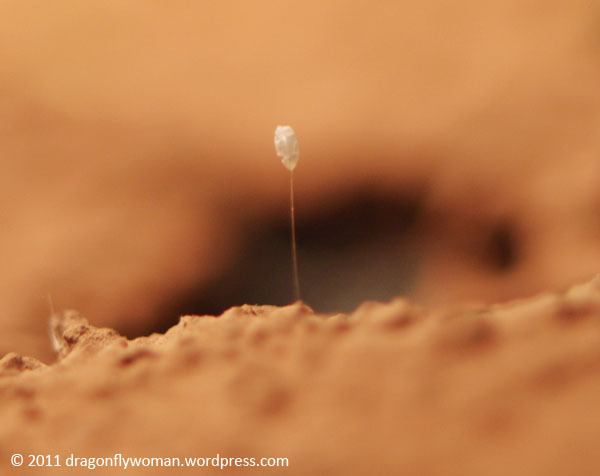 I wish more people took a closer look at insect eggs because they are fascinating up close. There are a ton of different styles and shapes and structures and vary quite a bit from group to group. They make great photographic subjects too because they don’t move! 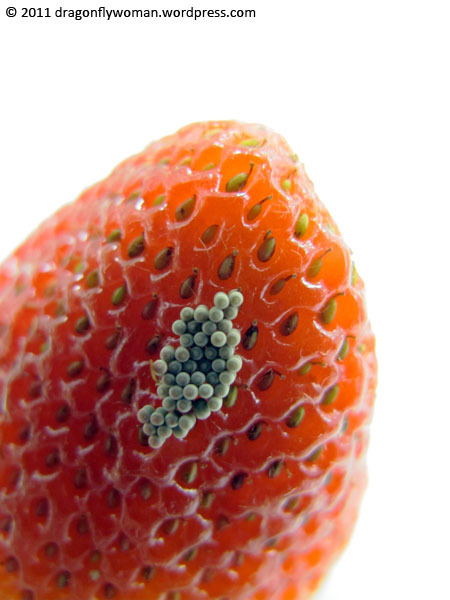 I encourage everyone to go out and look for insect eggs around their homes. And if you get great photos that you’d like to share, feel free to share links on/upload them to The Dragonfly Woman’s Facebook page. I’d love to see what you find! Ooh! Love your photos! 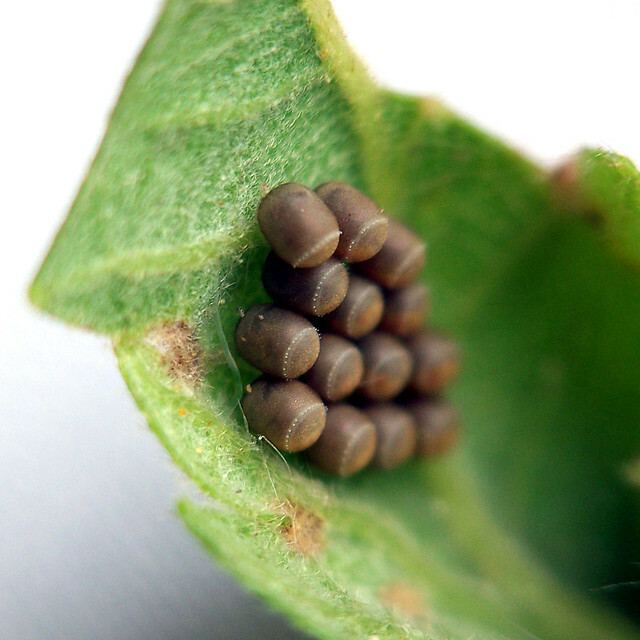 I am very fond of stink bug eggs because they have that ring of knobs around the top, but I didn’t know the soldier bug eggs had even crazier ones. Cool! 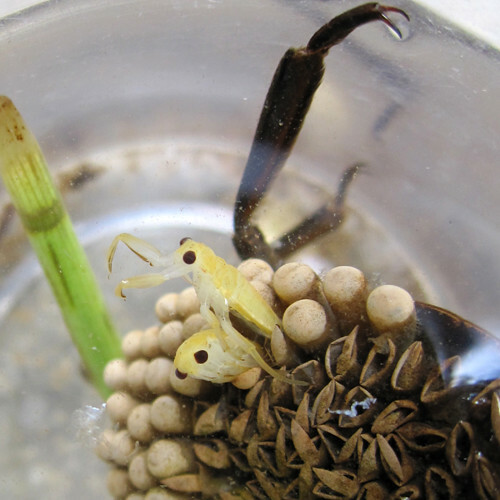 Of course, I love your water bug photo. Yea Abedus! Still, I can’t help but like how Lethocerus hatches better because they do this huge synchronous hatch rather than hatching one by one like Abedus does. 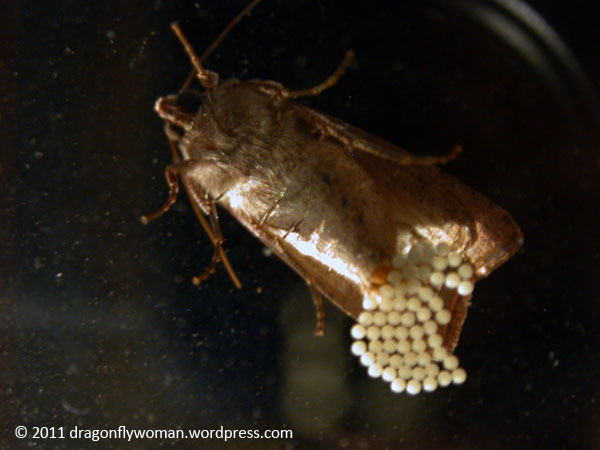 The bugs in the photo you liked all worked their way out of the egg (a later stage photo here: https://dragonflywoman.wordpress.com/2010/06/10/notesfromnabsday3/lethocerus-hatching/ and there’s a video of the whole process here: https://dragonflywoman.wordpress.com/2009/10/10/lethocerus-medius-hatching/) and then all fell out into my hands en masse. I had 200+ little 6mm long bugs in my hands! It was amazing! Yeah, that sounds about right. That is why I now carry my behemoth of a point and shoot with me EVERYWHERE I go now! I got tired of missing things. :) Glad you got to see a back brooder though! Aren’t they fabulous? I really love the bugs I work with. I love your Friday 5! This was really interesting to read. Thanks! I think they’re really fun to write, so I’m glad people enjoy them. Very nice post as always. I kind of ‘discovered’ the beauty and interesting features of insect/bug eggs late last summer with my mantid egg encasements. I’m developing an eye for finding them now, and I’m looking forward to spring weather to find more. I just love how that tiny fragile looking thread holds the egg upright. Nice photo! Way better than mine I will happily admit. 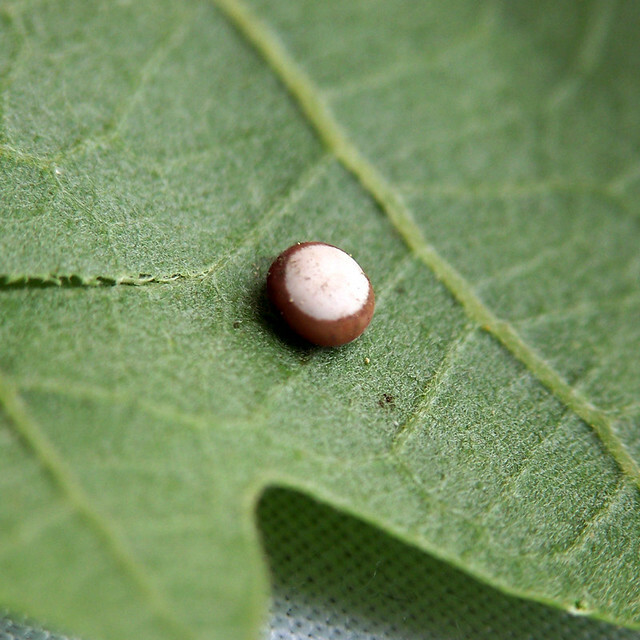 I think insect eggs are pretty amazing, though you can’t even see the best parts. All the little craters and ridges and polygons and such are stunning if you have a chance to look at them up close! Lacewing eggs take me back to a summer with a much younger me finding a long row of them on the steering wheel of a car my neighbor had left the window down on. (See, once upon a time, rolling windows up and down involved, well, rolling, and a lot of work. Kids today and your electric doohickies!) Nobody knew what they were, and it took me years to discover the truth. Back then, they were a mystery, just one of those strange bits of life in the world that have always fascinated me. Ha ha! I don’t have electronic windows or locks, in spite of having a 2000 model car! I still crank down my windows. :) How fun to find them in your car though! I’m glad you discovered their mystery eventually. They’re very interesting eggs! I especially love the last two shots- those are fantastic! Fantastic post and beautiful photos. I look forward to Friday Five. Amazing photos. I will be keeping a lookout for insect eggs this year following this. Thankyou!